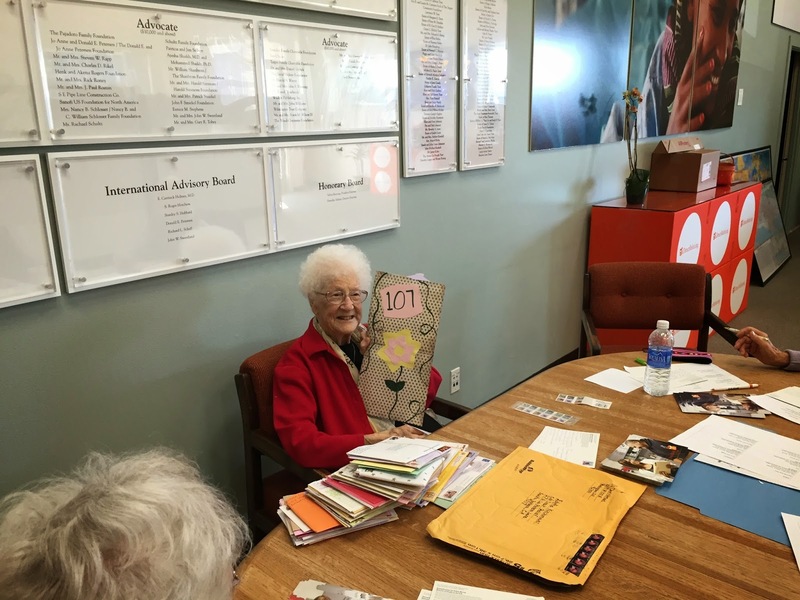 Edythe Kirchmaier just turned 107 years old. If you’re a Santa Barbara local, you may well have heard of her. In fact, even if you’re not (wait, where did you get this paper?) you may have seen coverage of her in national outlets from ABC News and Fox News to Hot Rod Magazine. 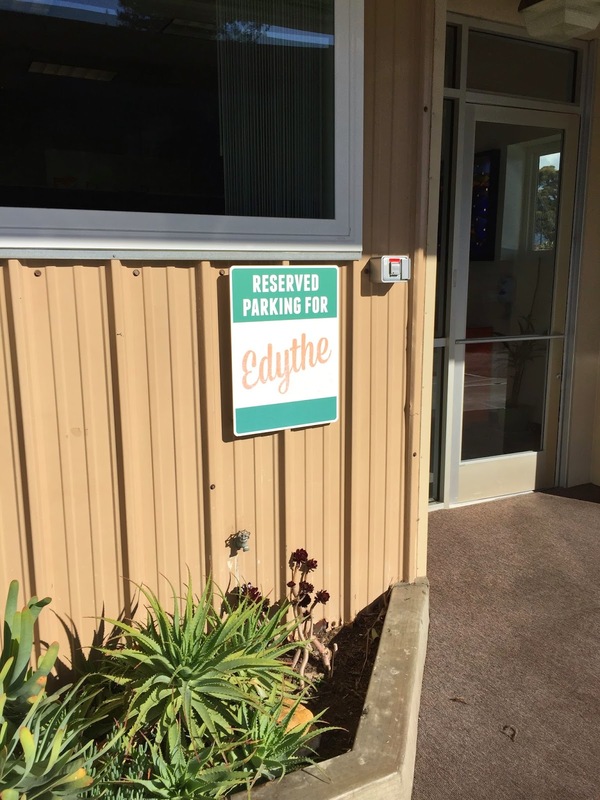 The enthusiast rag’s website did a feature on Edythe’s car ownership history. It highlighted one of the most fascinating facts about her: Edythe learned to drive on a Ford Model T. Now, nearly nine decades later, she’s still driving and is the oldest living licensed driver in California, and probably the whole country. A look at the Guinness world record for licensed male drivers reveals that there was a man who was licensed until 108 years old, and another who held a valid license until he died, either at age 105 or 110. There are no records specifically for female drivers, nor a general record. Also remarkable is that in that time, Edythe has never been so much as pulled over for an infraction. She verified this when I had the chance to sit down with her at the headquarters of Direct Relief, a Goleta-based medical aid organization where she has been volunteering for roughly 40 years. First, a bit of background on Edythe. She’s had a remarkable life of volunteerism, starting at 10 years old, knitting lice-catching “cootie belts” for WWI troops. Forty years ago, she began volunteering for Direct Relief, spending three years in Taiwan teaching English. And she still comes to the office every Tuesday to write thank you notes. They’ve even given her the best parking spot in the lot. Edythe came to Santa Barbara in 1938 with her husband, Joe. They were tired of the snowy Chicago climate, and figured it was time for a change. As an automotive columnist, though, I gently steered the conversation toward her car history. The Hot Rod spread details much of it, and it’s dominated by Fords, including Model A’s and Mustangs. Why Fords? “They were cheap!” she says. But Edythe also insists that they were quite reliable. She truly loved her Mustangs, though, and she and her husband owned a couple of them in the 1960s. Looking at a picture of the new Mustang next to the original, she thought that the car sitting in today’s showroom is much better-looking, a contrast to the nostalgia I’ve often heard from older drivers. In general, Edythe feels that car design has gotten better and better through the years, and the Honda Civic that an anonymous donor gave her a few years ago is a great example. Edythe confirmed that the car looks great, and as someone who’s seen the entire evolution of the Ford brand, I’ll grant her authority status. But does it move the bar in driving experience, too? 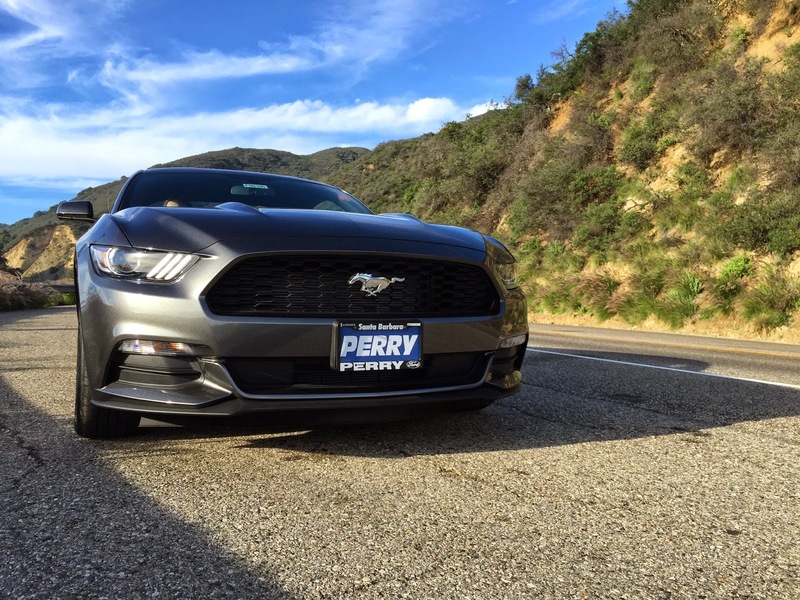 I recently had the opportunity to drive the all-new 2015 model, courtesy of Perry Ford. The dealership has sold every copy it could get of the four-cylinder EcoBoost turbo and the V-8 GT, but they had a 3.7L V-6 on hand for me to sample. To start out, the price was right. At just over 25 grand, it came in over $5,000 less than the Focus ST sitting right next to it. The most expensive versions that Perry has sold have crested $55,000, but with the Mustang you get a lot of car for the money, and I have a feeling Edythe would think Ford has lived up to the value story that won her over. The suspension was a bit soft in this base model car, and for someone who wants a real sports car I’d suggest upgrading to either the EcoBoost or GT, with a Performance Package. But Edythe would value a smooth ride more, and there’s a level of refinement that can’t be matched by the outgoing model, due to improvements such as increased chassis stiffness and – finally – an independent rear suspension. The outgoing model had a solid rear axle, just as her car did five decades ago. The V-6, even though it’s basically carried over from last year, happens to be a great motor, with a smooth and muscular sound and an eager response to the go pedal. The 6-speed auto transmission could stand to be quicker, even in sport mode, but flicking the steering wheel paddles to change gears through the hills proved more fun. Inside, the thoroughly modern design has some pleasing retro touches, like a row of toggle switches. These reside next to the red-bordered start button, which may have you calling the dealer for some launch codes. And while some of the interior materials of this base model car were cheap-feeling hard plastic, there was a nice faux-carbon fiber weave across the dash that added a sense of sportiness. Perhaps the pièce de résistance is the Track Apps program in the cluster, which lets you track your acceleration and quarter mile times, and watch a real-time g-meter. But our friend Edythe is probably less concerned with g-meters and soft cornering attitudes, and I wouldn’t expect her to know what to do with a steering wheel paddle. 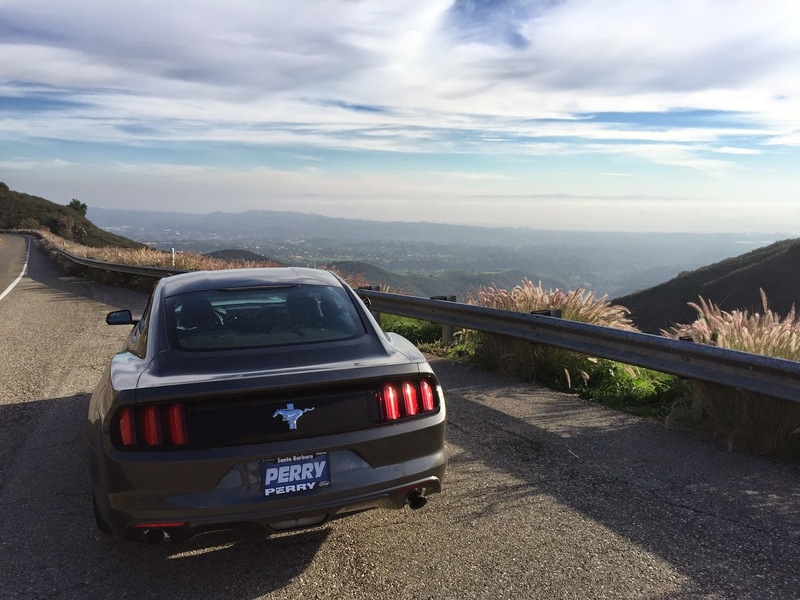 In fact, she believes that today’s drivers aren’t as careful as they used to be, so it’s probably a good thing that she wasn’t riding with me as I put the Mustang through its paces in the hills. But that’s okay; Edythe doesn’t need a shiny new sports car to feel young. Her spirit of giving and all the love she gets from her adoring Facebook fans – that’s right, she’s reportedly the oldest social network user, too – keep her spritely. But maybe when her Civic lease is up we’ll see her peeling out of Direct Relief’s parking lot in a new Mustang.